How can I model a breakthrough or large opening in a reinforced concrete beam and then dimension it? In such cases, it usually works to work with a surface model and result bars (see Figure 1). With a result bar, the internal forces of a surface can be integrated and output as stump sizes. Another advantage is that result bars with the specification of a cross section can also be dimensioned in the add-on module RF-CONCRETE Members. In the upper model of the example file, the result bar was pulled over the entire length of the beam (see Figure 2). 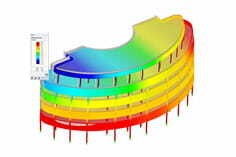 In the lower model, however, the result bars assigned to each individual surface. Accordingly, the result curves shown in Figure 3 are obtained. After calculation in RF-CONCRETE Members, the reinforcement images shown in Figure 4 are obtained. In the upper part of the picture shows that you would of course still have to manually adjust the correct distribution of the reinforcement in the breakthrough. In the lower model, however, the reinforcement is distributed exactly according to the cross-sectional dimensions of the result bars.